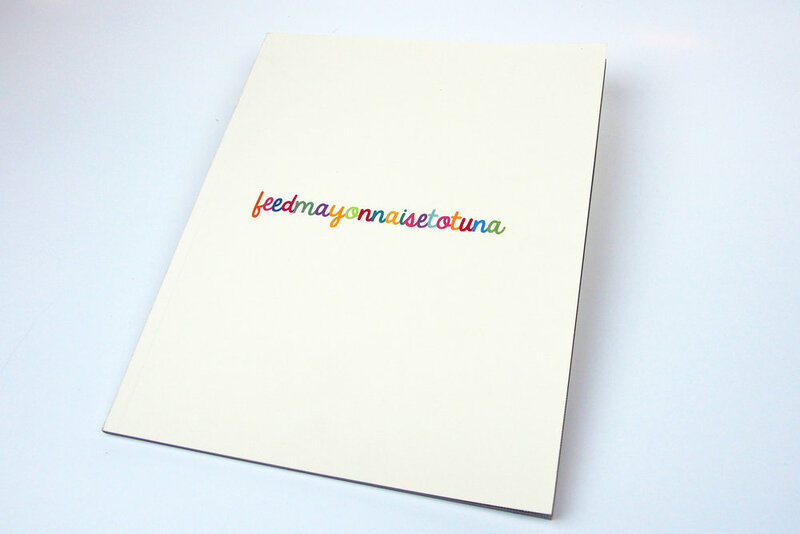 FEED MAYONNAISE TO TUNA is a limited edition (200 copies) art book hybridizing text and image. It is the end product of a month-long installation, Blue Sky Inside, at Likewise in Portland, Oregon. For this site-specific, social practices project, Likewise patrons were provided the means of 'blue-skying' ideas: Patrons would write an idea on a tag and select a colored balloon. The Likewise staff would then fill the balloon with helium and attach the tag. The patron would then 'float' the idea to Likewise's blue ceiling. As the ideas descended, they were collected, along with their still somewhat inflated balloons, in rows along Likewise's walls. As the fallen ideas accumulated on the walls, new patrons were attracted to them first, and then the opportunity to participate, organically influencing the content and genre of subsequent ideas. At the end of the month, the ideas were catalogued. Jacob Paul then broke the text of the ideas into constituent phrases: groups of words identified either by line breaks or end punctuation. From the palette of phrases, a collection of new text was arranged. The arrangements were then photographed and forwarded to book artist, Mariano Herman Spina. Spina then created an artifact in which the text was printed in Cyan Monochrome, interspersed with abstracted images of the balloons and the doodles and drawing from the original tags. The books are designed to be as flashy and easy as brightly-colored balloons. The ensuing text is an essayistic exploration of the kinds of conversations and interior monologues possible inside of a collaborative art space posing as a bar. Awkward demands complete crass jokes, communion is often almost accomplished and then rejected, conversations bleed into each other, interior musings take physical shape on the page in the slips of text's physical arrangement. "I've spent most of my life working as a self-taught graphic designer & printer. At the turn of the century, digital media & animation caught my interest, expanding my knowledge into different areas and strengthening my enthusiasm for the same creative process I continue to thrive on. I worked as a designer, multimedia developer and art director for BBH, MTV, Nickelodeon, Wieden + Kennedy, Grey, Peñabrand, MVNP and Vassallo Diseño. Working for clients like NYC, Levi's, Johnnie Walker, ESPN & HBO. Portland is my home since 2004, where I've set up my printing & publishing shop, focusing primarily on short run production of books and packaging for the music industry. I've founded Unwork, Incorporated in 2001, as a vehicle to centralize and promote all these activities."